Nature-based play is a cornerstone of childhood and learning, yet it is a disappearing occurrence. Sometimes just getting your kids outside feels like a huge undertaking in itself. Trust me, I’ve been there. Even as a nature-lover, it can be tough to spend enough time outdoors with my kids. It doesn’t have to be that way, though. There are so many reasons and ways to get your child outside! The benefits are absolutely worth the effort! Why is nature-based play important to include your homeschool? Nature-based play is an essential part of a child’s physical development. Fresh air, sunshine and outdoor activity is great for children physically, and it also increases their mood and behavior. That sounds dreamy, doesn’t it? When we made the decision to homeschool, I knew that I wanted nature-based play to be a big part of our children’s education journey. I had always been a nature-lover and felt like it was an important building block that contributed to my love for learning. Your kids can learn a lot from simply being outdoors. Children are naturally curious and being outside fuels their desire to learn. Have you noticed how many questions kids will ask when they see something that interests them? They are like sponges and being outside will encourage their desire to learn about their surroundings. Nature-based play is a strong starting point for cross-curricular learning as well. Having a nature journal is just one example of how you can use nature-based play to weave in other learning. Your child can use a nature journal to write or draw about what they saw/did in nature. Now you are not only giving them the opportunity to play outside, but also to use other skills to reflect on their time. Learning doesn’t stop at a nature journal, though! You can use sticks and rocks to solve simple math equations, or talk about the geometrical angles that tree branches make. It’s important that your kids see that learning is everywhere and valuable connections can be made. How can you include nature-based play in your homeschool day? Not everyone loves the outdoors. But, seeing its benefits makes it worthwhile. Commit to getting outside for a defined period of time, every day. It’s often the simple act of getting outside that hinders us from do it. Once we are outside playing, the rest comes naturally! Provide tools for outdoor learning. To get the benefits of nature-based learning, you don’t need to live on a 100-acre farm, nor does your lawn need to be littered with every single toy that Amazon has to offer. Quite the opposite, actually. Providing your kids with some basic outdoor learning tools will inspire their nature-based learning. Things like a magnifying glass, a nature field guide book on birds and bugs, or an all-in-one, backyard nature kit like this one, are great for encouraging nature-based play. One of the most powerful ways to inspire nature-based play in your homeschool day is to read books about nature. When kids have background knowledge on a subject, it empowers them to make connections that will help them learn more and have a vested interest. A nature field trip can open a whole new world for your child. Even going to your local park can spark conversations and interests. Find out what interests your child the most, and research where you can go to support their interest. If they love bird watching, find out when and where you can see migratory birds. Interested in how trees grow? Visit a tree farm. It sounds simple, but these field trips into nature can change the way your child views learning. Sometimes weather doesn’t permit nature-based play outside. Why not bring nature inside? To keep your kids connected with nature, they can do simple activities like collecting and painting rocks, or using leaves to do a crayon rubbing on paper. Nature-based play is exactly that– play. Let your child take the lead and decide what they want to explore. Of course, you can always encourage and guide your child, but there is no rush and no right or wrong when it comes to nature-based play. Take your regular curriculum outside. Just being outside helps us stay connected with nature. If you need a simple way to get outside and you have a regular curriculum that you follow, take your work outside! You can even cut down on art messes by simply taking them outdoors. This will quickly turn into a homeschool favorite and will lead to more nature-based play. 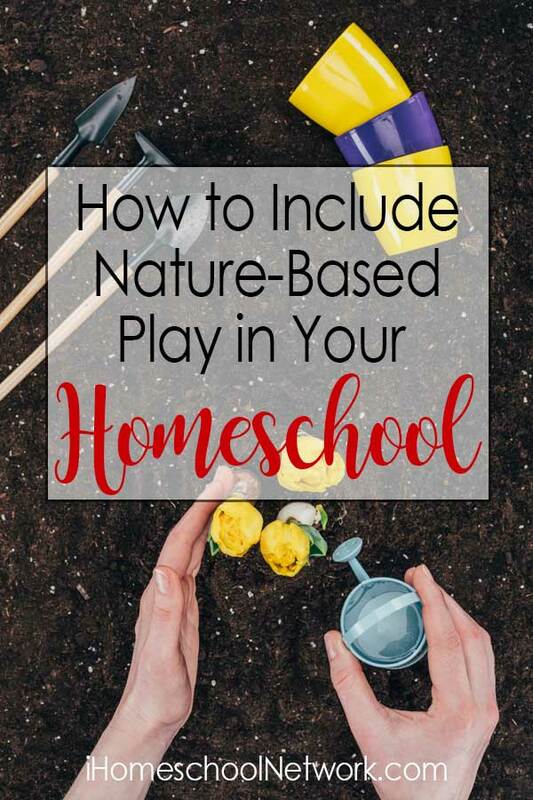 Including nature-based play in your homeschool day doesn’t have to be complicated. Most kids enjoy exploring the great outdoors. Simply getting outside is a great start to more in-depth learning. With your encouragement and genuine interest, your kids will yearn to stay connected with nature. Katrina is a chaotically organized unschooling mom of 2 kids--- ages 6 and 3. She is a former teacher and instructional coach and loves the flexibility of homeschooling. Her biggest passion is child-focused learning and helping parents to create a love for learning in their kids.